anti-Obama story.) There is some variation in the Obama smack-downs, but all of the others hammer home the exact same arguments using the exact same verbiage; each is pretty much interchangeable with the other, and might well have been penned by a single source. ….On the other hand, MSNBC has only one story covered by all three programs: the obligatory anti-Romney segments, which do not have the uniformity in commentary that FOX has with its anti-Obama segments. (And the truth is that grouping Maddow’s commentary with Shultz’s or O’Donnell’s is a huge stretch. Shultz and O’Donnell’s Romney rants seem more akin to the FOX anti-Obama screeds, politics aside.) Past that there is very little overlap at MSNBC. 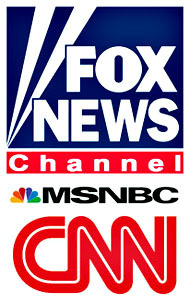 Whereas FOX’s shows have the appearance of a concerted and strategized effort, the hosts of MSNBC are all over the map. But liberals? Well, over the past few years we’ve decided that we’re willing to yell into the camera too if that’s what it takes to compete, but by God no one tells us what to say. That’s just too humiliating. However, I suspect that this is at least part of the reason that conservative memes find their way into the mainstream media more often and more forcefully than liberal memes. They just repeat theirs more vigorously. Pretty good strategy, huh? Dem to Liberal Donors: Wake the F#!$ Up!